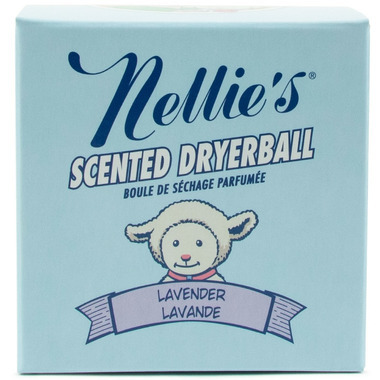 Add the calming scent of lavender to your drying experience with Nellie’s newest addition to the Dryerball family. Made from 100% pure New Zealand wool and injected with essential oils to add a hint of scent to your drying experience. Safe on all dryersafe fabrics. The dryerball comes in a single pack and the scent lasts approximately 50 drying loads. Directions: Toss 1 scented wool Dryerball in with your 4 wool Dryerballs to help lift and separate the clothes for improved drying and clothing softness, as well as a great scent! Love these! They smell great! Does aid in better drying time and deals with static well enough. Pleasant scent but I never detected much transfer to laundry from dryer ball which is bit disappointing for sheets and towels. Otherwise good product. First time ordering this product, as a girlfriend really liked this product. I was pleased with product, natural and has a lovely light scent. Only thing using dryer balls, with a light load, the ball(s) can be noisy, moving around in the dryer. Amazing smell. So calming. Love this product. And you only really need one! I love this dryer ball. It makes our laundry smell so amazing each time and lasts a long time! I love the ball. Have used it 3 times so far, and it works terrific. Love the scent. Love this product! I throw it in with some of my regular wool dryer balls and it's enough to lightly scent all the clothes in there. Especially love it when I use it with the bedding, smells so fresh! I am so happy to have found these wonderful dryer balls. Lavender oil is my favourite essential oil and I love opening a dryer to the aroma! I also use these balls in my daily business. I collect vintage clothing. The Lavender balls placed in a box with certain vintage pieces help them the clothing to rid itself on any old musty odours. I wish these were available at my local supermarket! Not very impressed. The lavender scent is cheap smelling and not very nice when left on the clothes. Also one ball really is not enough to dry noticeably faster. Wow!! Fantastic scent! Fluffy laundry! No chemicals. Awesomeness! I use this in addition to a set of Nellie's All-Natural Lamby Dryerballs and I am very pleased! Our laundry is soft and lightly scented without the use of chemicals and I feel safe using this product on my infant son's clothing and towels, as well as my own laundry. Highly recommend! How long will the fragrance stay in the ball I cannot tell. Excellent fragrance.